With Roma Downey and Mark Burnett as producers, you can pretty well expect an uplifting message. A few of the actors are celebrities here in the States, but it was refreshing to see so many fresh faces in the cast. 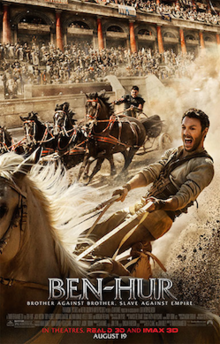 In case you are unfamiliar, Ben Hur is the story of a Jewish prince, at the time of Christ. Judah Ben-Hur’s family adopts a Roman orphan, Mesalla. They grow up as brothers and best friends. Due to his orphan past, Mesalla becomes increasingly restless, as he ponders his place in the world. His love for Judah’s sister is frowned upon by their mother, so he eventually sets out to join the Roman legion and pursue his fortune. When Mesalla returns, he asks for Judah’s help in keeping the peace for the arrival of the new Roman governor. Instead, Judah protects a Jewish assassin, by taking the blame for an attempt on the life of the governor. An angry Mesalla betrays Judah to a long, slow death as a galley slave. There is plenty of action. Judah’s escape from the galleys and near drowning; Mesalla’s battle exploits; the chariot race. The chariot race. Possibly the highlight of the entire film. Even though you know how it turns out, getting there keeps you on the edge of your seat. The horses are fantastic and every precaution was taken to ensure their safety during filming. The actors insisted on performing nearly all the race scenes themselves, instead of letting the stuntmen have all the fun. The Roman Circus was a place of blood and violence, and the chariot race delivered. Even without fake blood spurting on the screen, there was plenty of gory death as charioteers were systematically ejected and trampled. In the end, hatred and revenge give way to forgiveness and reconciliation, largely due to chance meetings with Jesus. As it should be. Go see it today and support good, clean, uplifting filmmaking!